Roller conveyors are used to convey products which have defined shape, like, pallets, cartons, boxes, etc.This type of conveyors are used for Light, Medium & Heavy Duty applications.Each Roller is machined from ERW pipe & provided with bearings at both the ends & a stationary shaft. Roller conveyors are used to convey products which have defined shape, like, pallets, cartons, boxes, etc. 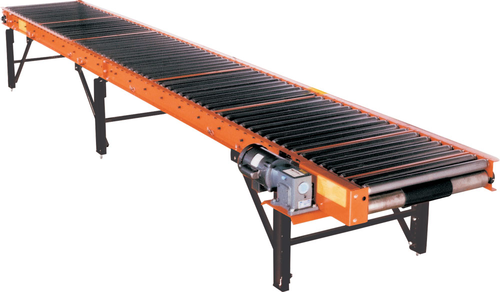 This type of conveyors are used for Light, Medium & Heavy Duty applications. Each Roller is machined from ERW pipe & provided with bearings at both the ends & a stationary shaft. This shaft is bolted onto the frame of the conveyor. These conveyors are modular in construction & Frames are manufactured in Modules of 2500 MM. Rollers can be supplied in MS Galvanized, MS Chrome Plated, SS 304 or SS 316. MOC for the conveyors is MS-Powder coated, SS 304 or SS 316. Roller diameter, Roller Pitch & Roller width is designed as per load & application requirements.
" Tirupati Metals success is based upon our continuing research, development and integration of the latest technologies in moving and assembling heavy and cumbersome loads. Over the years Tirupati Metals has become a problem solving company that provides customer with solutions to their handling problems. "